Stay at this full-service Toronto hotel just steps away from the financial, entertainment and cultural districts of downtown. 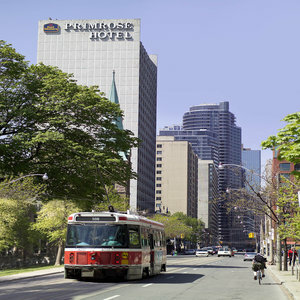 The BEST WESTERN Primrose Hotel Downtown-Toronto is conveniently located with easy access to key area attractions and business locations including the beautiful Maple Leaf Gardens and several downtown theatres. This Best Western hotel features renovated guest rooms and suites with all the right amenities including high-speed Internet access and cable television. The hotel offers business travelers a dedicated executive corporate floor. Best Western Business rooms with upgraded amenities are also available. Expect all the deluxe amenities of a full-service hotel with the comfort of home. A friendly staff is ready to ensure a comfortable and memorable stay. Make an online reservation today at this Toronto, Ontario hotel.